The farcical citizens.lk website continues to reside on the web, after being set up in 2009. A lot of the features are already dysfunctional – you cannot for example register on the site anymore. This archive does not contain any records gathered via the site – it’s just a record of what an outrageous attempt to invade the privacy of Sri Lankans via the web looked like at the height of the war. Though I’ve never once seen a reference to it, there exists an official website to document the progress of implementing the LLRC’s recommendation. 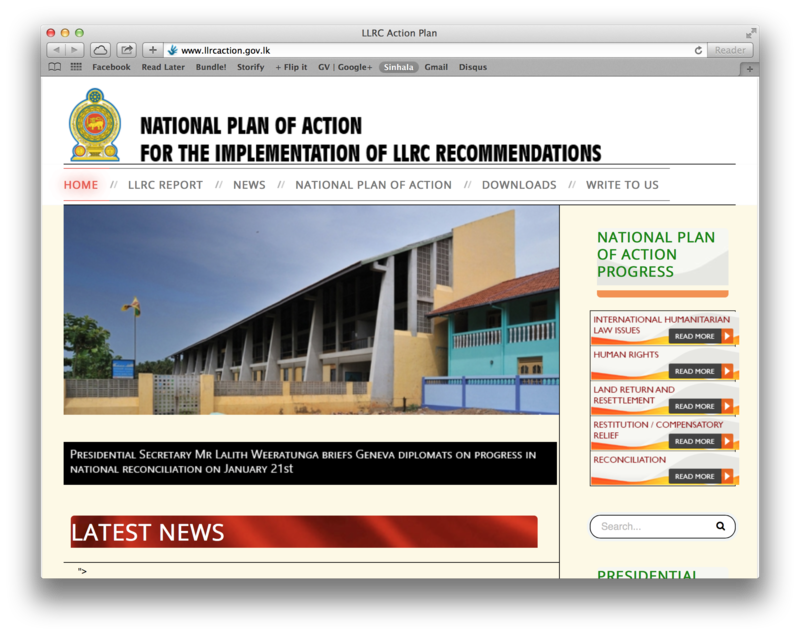 http://www.llrcaction.gov.lk was discovered last week by accident, and is distinct from the LLRC NAP monitoring web page on the government’s Data and Information Unit of the Presidential Secretariat website. Download the complete archive of the site here. Download the complete archive of the site (taken 3 September 2014) here. 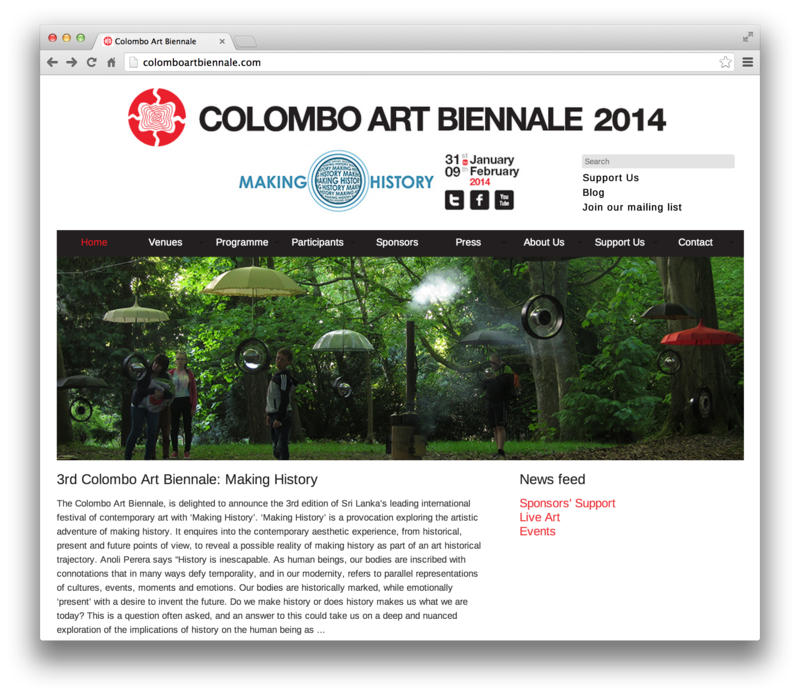 The Colombo Art Biennale, is delighted to announce the 3rd edition of Sri Lanka’s leading international festival of contemporary art with ‘Making History’. ‘Making History’ is a provocation exploring the artistic adventure of making history. It enquires into the contemporary aesthetic experience, from historical, present and future points of view, to reveal a possible reality of making history as part of an art historical trajectory. Anoli Perera says “History is inescapable. As human beings, our bodies are inscribed with connotations that in many ways defy temporality, and in our modernity, refers to parallel representations of cultures, events, moments and emotions. Our bodies are historically marked, while emotionally ‘present’ with a desire to invent the future. Artists for CAB 2014 include many of Sri Lanka’s most recognized established and emerging artists, as well as artists from China, USA, Britain, Italy, Austria, Scotland, France, Sweden, India, Bangladesh, Nepal, Qatar and Iran, all of whom will be presenting works working towards the this year’s theme ‘Making History’. Download archive of CAB 2014 website here. 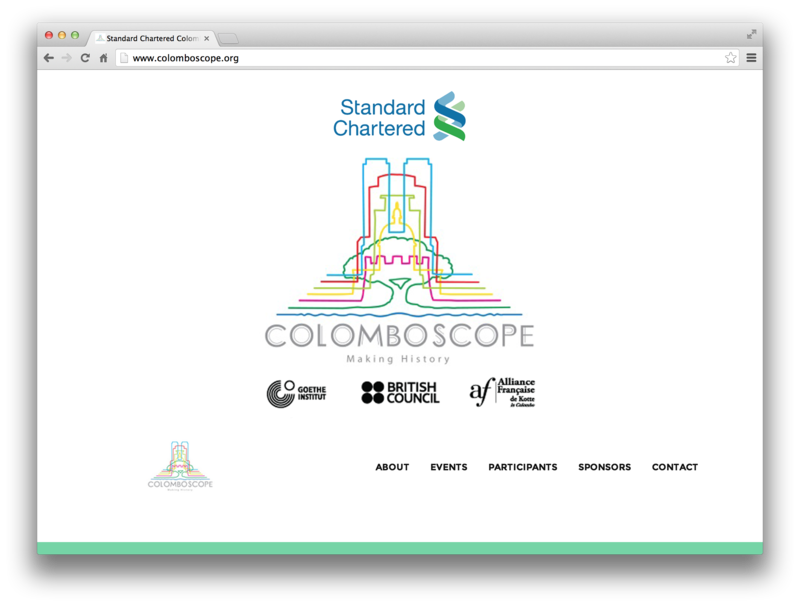 Standard Chartered Colomboscope is an arts festival celebrating contemporary literature, music, film and performing arts organised by Goethe-Institut and British Council. Download an archive of the 2014 site here.